My normally good eating habits haven't been so great since Thanksgiving. The holidays seem to have gotten to me this year and my food choices have gone down hill. Don't get me wrong I still have cooked from scratch and enjoyed healthy dinners, but I have snacked more than usual and eaten more sugar. Luckily I haven't gained any weight, but I feel less than my normal self so I know that it's time to get back on track. One of the major things that I haven't been doing well with the last couple of months is breakfast. I have been good about eating breakfast since I had low potassium last winter. However, since Thanksgiving I have been skipping breakfast or not eating enough protein in the morning. This weekend I decided to get back on track and made some healthy snacks for the week. One of the new recipes I tried was for Quinoa-Pumpkin Seed Granola from the January issue of Better Homes and Gardens magazine. This recipe has 9 ingredients. It takes 50 minutes of total time, 20 minutes of which is active and makes 13 servings. I had no problems finding any of the ingredients at my local grocery store. I chose to use dried cherries for the dried fruit called for in the recipe. The recipe states to stir the mixture twice, but I forgot one of the stirs, so I only did a total of one stir half-way through the baking time. I kept my granola in larger pieces since I was going to eat it as a snack instead of with milk. I think I prefer the large chunks like I made. I followed the remainder of the recipe as written. My husband and I really enjoyed this granola. The quinoa was great, I loved how it was crunchy and the whole almonds were delicious. The cranberries provided a nice sweet contrast to the crunchiness of the nuts. My husband thought that it would be even better for adults with a small amount of cayenne pepper to have a sweet/spicy combination. Looks delicious! I love pumpkin seeds and granola = yummy! Thanks :) I love granola and pumpkins seeds also, they are both yummy and delicious together! We love a good granola. Quinoa is very healthy too. Happy New Year! Yum! I eat granola pretty much every morning, so I'll have to try this recipe. It sounds soooo good. Great photo, too! Thanks for the sweet comments :) I eat a ton of granola also, it's great as a snack or for breakfast, dessert, pretty much anytime of the day! Any granola with quinoa should be named "colon blow." It's tasty, but it does come at a price! It can be upsetting to your stomach if you eat too much I agree :) That's why I try to always eat everything in moderation since my stomach can be so hit or miss with things, especially since I have a gluten intolerance now. Thanks :) I have been trying to get back on track also, good luck! I've been skipping breakfast lately too, but this looks like the perfect motivation to start eating eat again! I'm slowly getting better about eating breakfast :) I have never been great about eating first thing in the morning, especially when I was younger. 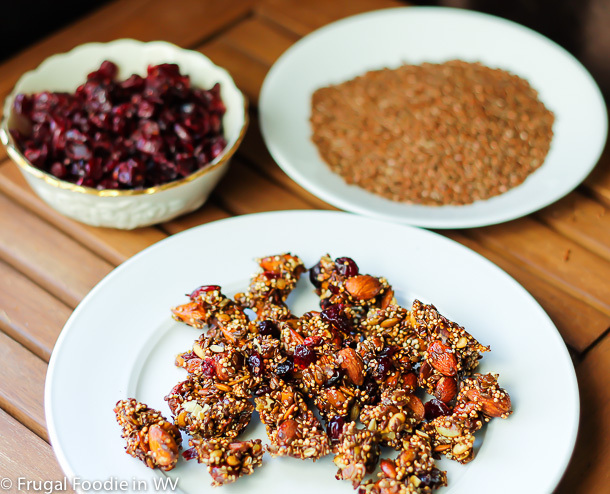 This granola is a great snack to grab on the run though, which works well with my schedule!